Can you believe we've had XiXi in our family for one whole week? In some ways it seems longer, in some ways shorter. I already look at his Gotcha' Day pictures and see a different child. His passport picture, taken right after we met him, is so serious and sad-looking. That's not to say that he doesn't feel the sadness of all that has changed in his life in the past week (and two weeks since he left foster care), because I'm sure that he does, but he seems much more comfortable and confident with us. I can see that we're making great strides in becoming a family. It's also a privilege to see other children in our group too, growing more comfortable in their new lives. We have some seriously cute babies that we get to spend our days with. Their adorable baby ways make me think back nearly 5 years ago to the adoption of our sweet Cholita. Oh, how we loved that baby. Back then, she was the youngest child in our travel group. This time, we have the second oldest. Although XiXi isn't what I'd consider an "older child" adoption, he's most definitely not a baby. Over the past few days, I've been thinking about what I consider to be the pros and cons of non-infant adoption. Con: An older child needs to eat a whole lot more than congee. Con: There are no squeaky shoes in older child sizes. Pro: There are no squeaky shoes in older child sizes. 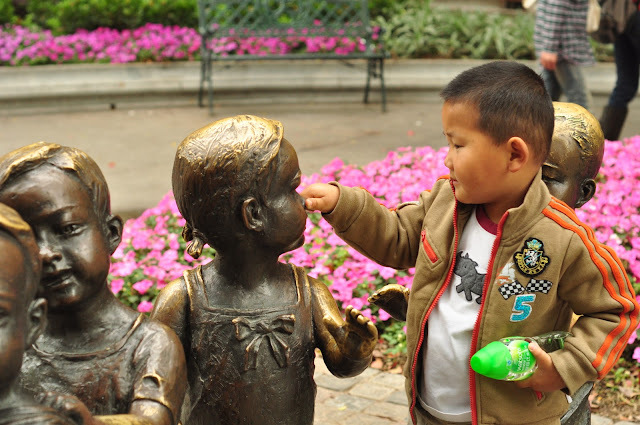 Con: An older child might not willingly pose with all of the statues on Shamian Island. Pro: An older child might tweak the noses of the statues on Shamian Island. Con: An infant does not know that the popular TV show "Pleasant Goat" even exists and a parent might completely miss out on that cultural education. Con: With an infant, their bathroom regiment is limited to diapers. With an older child, when you're out and about, you need to know the location of nearby squatty potties. Pro: You don't need diapers and an older child can handle those things on their own. Con: An older child might handle those things so well on their own that they might (hypothetically, of course) tell their mother that they need to use the bathroom right when their mother is in the middle of an ATM transaction and unable to respond to their "shaow shway" request and an older child might just take matters into their own hands and may possibly exit the bank and pull down their pants and "shaow shway" right into the metal sidewalk grate. It could happen. Con: English language learning with an older child is a more deliberate process. 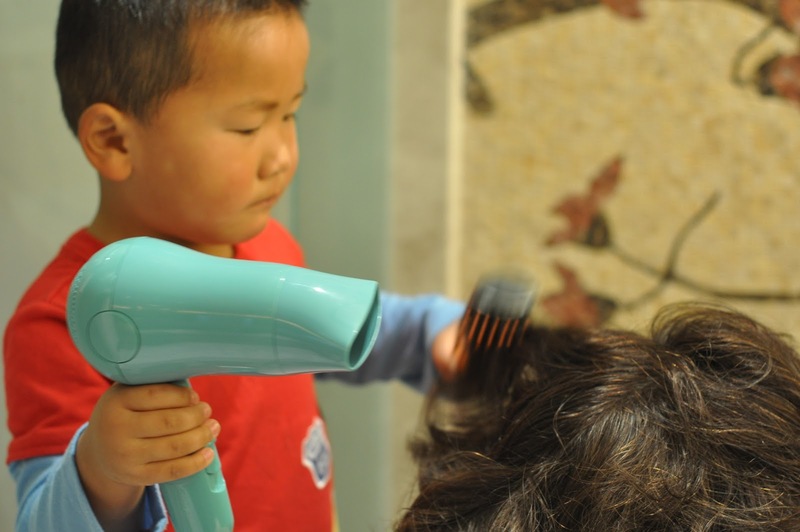 Pro: An older child can whisper in your ear about 20 times a day, "Wo ai ni, Mommy." And they might even point to themselves and say, "Good boy" in English. That might make you very happy. Con: With an infant, thier mobility is limited; with an older child, be ready for a workout. Pro: It's cheaper than a gym membership. And as an added bonus, with an older child, when your cheapy stroller's wheels get all skeewampus, they can reach down and get them straightened for you all by themselves. Con: An infant probably wouldn't challenge the cheapy stroller's weight capacity in the first place and your wheels might be completely fine, making the stroller issue a wash.
Con: An infant could care less about their parent's personal care regiment. Pro: An older child might insist on styling their mother's hair for them. Con: A mother might look rather wind-blown for the rest of the day. Con: A bigger child might mean bigger melt-downs. Pro: A bigger child might mean bigger hugs. We're all learning and growing and we love our truly amazing XiXi. I think you're pretty amazing as the Mommy! Xixi will learn with time how truly blessed he is to be a part of your family! Love the writing! What a sweet boy XiXi is! We adopted a 3 year old almost 5 years ago. She was so easy in China, like a perfect little robot. I think she was speaking English by the time we headed for home. Just wait, one more week, and XiXi will be talking up a storm in English! I am so happy I found and and reading your blog! We are currently logged in and waiting for a little girl in Kunming. Her name is Wu Shu Juan (soon to be Ana Lauren) and she is 3 1/2 years old. XiXi is absolutely precious! It is so helpful to read about your experience with a son of similar age :) I wonder if our children might know either other? There is a picture of our little one in the Stevens folder on the yahoo group. Hope you enjoy the rest of your trip and that bonding continues to go well! (((Big Hugs))) as you and XiXi enjoy the endless PROs together (and the amusing CONs, too)! The photo of XiXi styling Mama's hair is adorable!